Tokyo Concerts Lab. – Tokyo Concerts Lab. HOME > Tokyo Concerts Lab. Since 1969, Tokyo Concerts Inc. administering Tokyo Concerts Lab. has contributed to creating new music pieces called contemporary music with composers and musicians, being active at the forefront. We believe that the challenging spirit of contemporary music is one of the important elements to develop our culture. That is the reason why we named our hall ‘Lab’, laboratory. We hope that your ideas and creativity will create new opportunities to connect art with people. The size of Lab. is 190㎡ and the number of seats are 120. Lab. is very suitable not only for ensemble concerts and performance art events, but also for rehearsal of orchestra, choir, and dance, etc. We look forward to receiving your bookings. * In March, we had a renewal construction and the area was broadened from 160㎡ to 190㎡. The fee for using on the weekdays, weekends, and holidays is the same. Application should be submitted from one week before to 1 day before the day you use, only by phone call. Depending on our staff’s availability, we may not be able to rent. Matsuo Musical instruments CO.,Ltd. manages to tune the piano. Fee is based on the provision of Matsuo Musical instruments CO.,Ltd. When you need our staff’s support for the stage lighting or receptions, etc., please let us know. ＋81332009755) and inquire about the availability. We are open from 10am to 6pm JPT, on weekdays. For concerts or other types of performance: the first business day in a month, 1 year before the date of using (minimum number of time frames to book is 2). 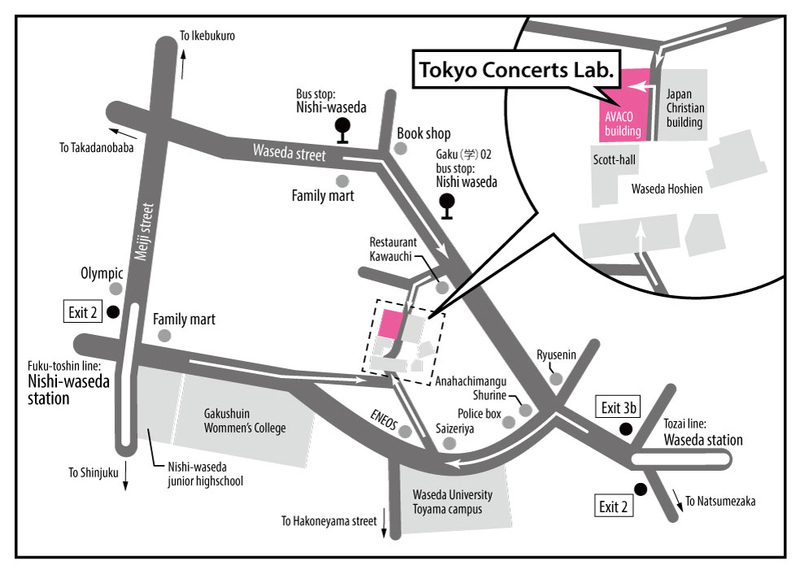 Send the application form below via e-mail (to lab@tokyo-concerts.co.jp) or fax (03-3200-9882). After issuing the invoice, please pay the fee within 2 weeks. If we couldn’t confirm your payment in a 2-week period, the reservation might be canceled. All bank charges-commission fees are paid by the customer. After payment, we will issue the confirmation note. Please, bring it and show it when you are about to use our hall. Please contact us for changing or cancelling your booking. It is required to pay cancellation fee when you cancel your booking 2 weeks after you got the invoice. *If you have already paid the fee and you wish to cancel the booking within 2 weeks after issuing the invoice, we will refund all fees. After 2 weeks have passed, we will return the fee with the cancellation fee being subtracted. Please, pay the bank transfer fee. As for the fee of using the facilities, we will refund all. Please be punctual about time and kind enough to carry your baggage in/out. Also, leave the hall as clean as you found it. If you need to use our car parking, please let us know in advance. If your car is a large-sized car, please ask us if it’s possible to park. Smoking is not permitted in the hall. There is a smoking area outside. Please follow the instructions of the staff. Also, check the emergency exit, evacuation route and the placement of fire extinguisher, etc. You are not allowed to transfer or sublet the hall without our permission. We will not take the responsibility for theft, loss, and personal accidents in the hall. In case you caused damage to our facilities in the hall, please inform the staff immediately. If the damage is caused by you, we may ask you to compensate it.